I love potlucks and dinner parties and gatherings because it makes it so much easier to cook. It’s tricky sometimes to make food just for two, let alone just one. Maybe I just need to invest in smaller cake pans. But truly, there is a real dearth of recipes when you’re just cooking for a couple of picky, bird-like eaters (that would be yours truly and my better half). Attention must be paid to the singles and doubles out there! Or maybe it’s just a call to have more of you over for dinner. Consider this an open invitation…. Back to the cake. The cake. 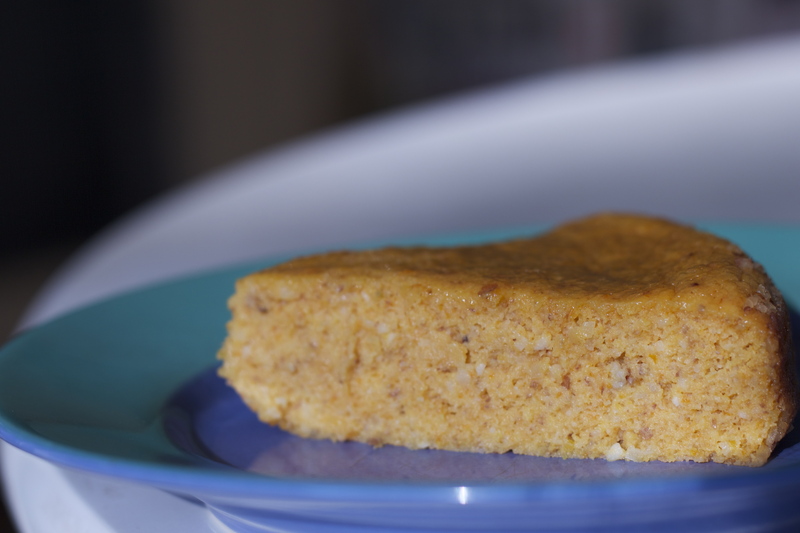 This cake is one of the easiest cakes I have ever made, it has all of five ingredients and you pretty much just whisk the heck out of them and pop them in the oven. There’s not even any butter so you can eat like three pieces and pretend it’s healthy. And the coolest part is you use whole oranges. You boil the oranges first so they are nice and soft, squelch them to a pulp in a food processor, and mix it all together. 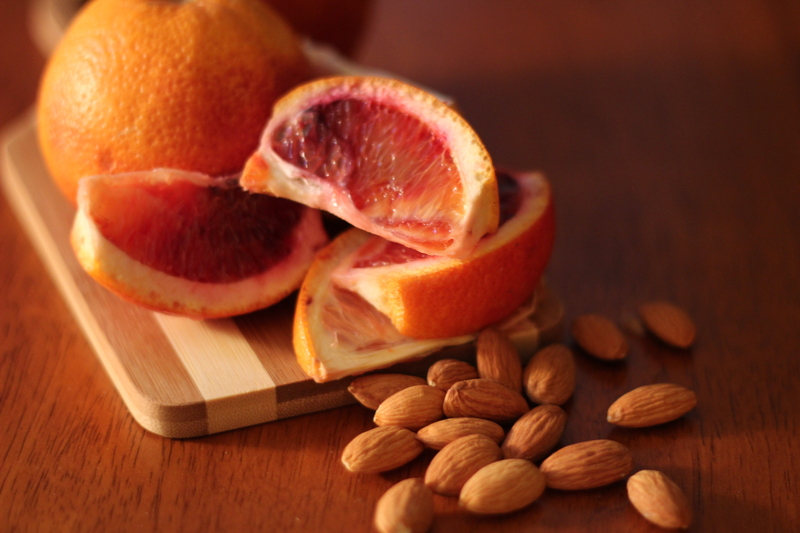 The peel and pith along with the sweet flesh add a depth of flavor that is incredible. Full disclosure: I ruined my first attempt by following this recipe exactly, which called for setting the oven to a steamy 400°F and baking for an hour. It smelled delicious and I think there was a tiny section in the middle that was cooked perfectly….surrounded by a blackened rubbery ring of ruin. Don’t do what I did. Check the darn thing after 30 minutes to see how it’s coming along. You will be rewarded with a fragrant, densely flavorful, extremely moist, just-sweet-enough masterpiece. And if you don’t eat the whole thing, you won’t have a hard time finding someone to help you. Note: This cake is very, very moist. So moist that I almost think you could leave out an egg or two and still have something delicious. I bought whole, raw almonds and whirred them in my food processor for about a minute to make almond meal–alternatively, I think pre-ground almonds are available in some grocery stores. 1. Butter the bottom and sides of your cake pan. 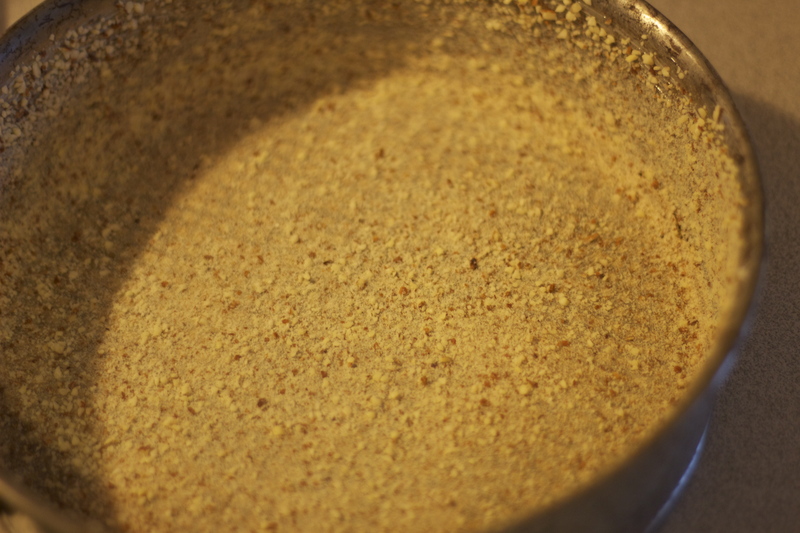 Use ¼ cup of ground almonds to coat the bottom and sides. Set aside. 2. 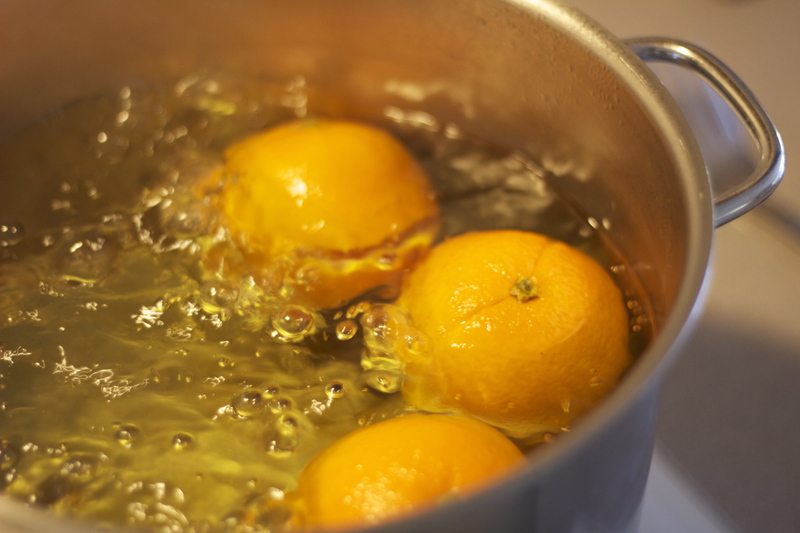 Wash the oranges and simmer them in the water for about two hours. They will float and bob near the surface; turn them every so often to make sure they cook on all sides. You should be able to slide a knife in easily when they are finished. Cool them on the counter for at least 30 minutes before proceeding. 2. 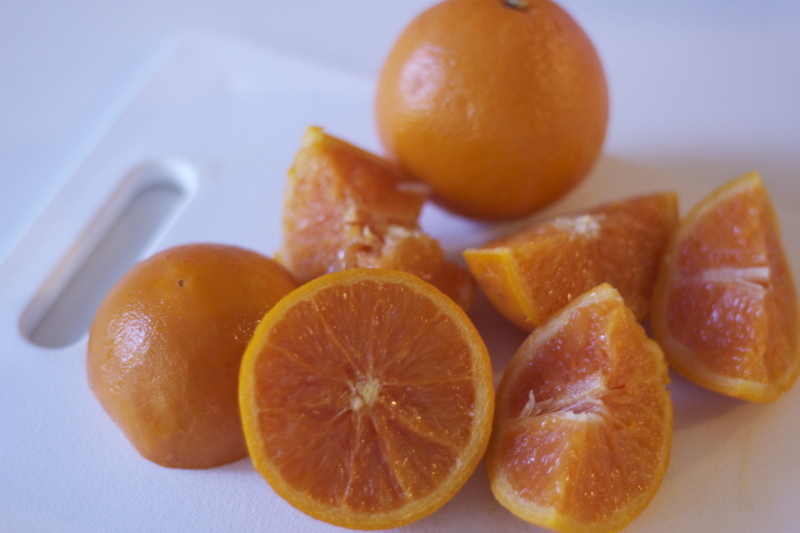 Slice the cooled oranges into quarters and remove any seeds. 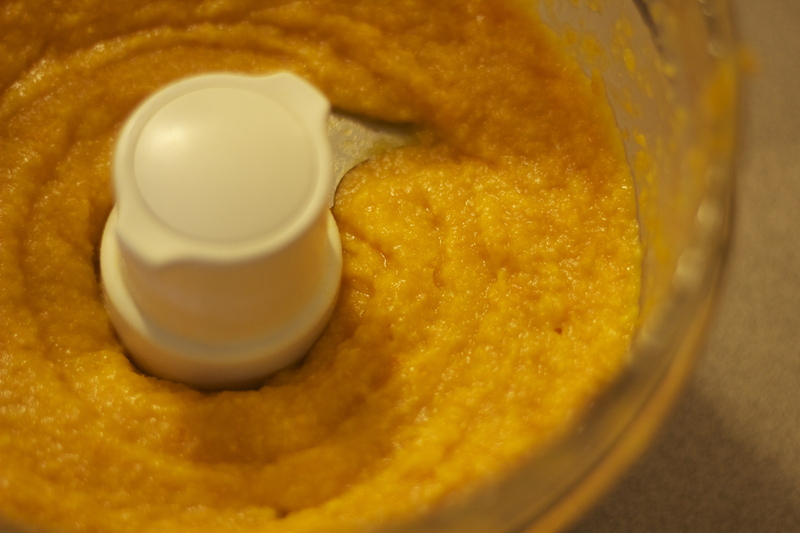 Puree the slices, peel, pith and all, in a food processor until they form a uniform pulp. You should get about 2 liquid cups of mush. Some small pieces of peel may remain; I found this added a pleasant texture to the finished cake but you may decide to pick them out. The ones you choose to leave in should all be smaller than your pinky nail. Preheat your oven to 350°F. 3. Beat the eggs in your food processor or a large bowl and add the sugar. Whisk or whirr vigorously for 2 minutes until the sugar is mostly dissolved. Scrape down the sides. 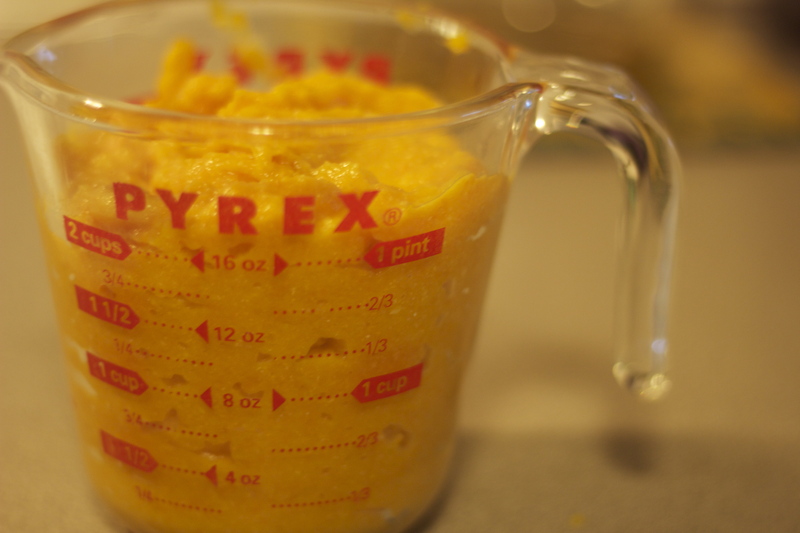 Add the almond meal, baking powder, and orange pulp, and mix until smooth. 4. Scrape the batter into your prepared pan and slide it into the oven. Bake until a tester inserted near the center comes out clean, about 45-50 minutes. Serve with fresh sweet fruit, dark chocolate, or whipped mascarpone. This recipe is really unique! thank you, i was so intrigued by it i had to try it! thank you, sweet frugal! 😀 it tasted pretty good too…. I must try this. 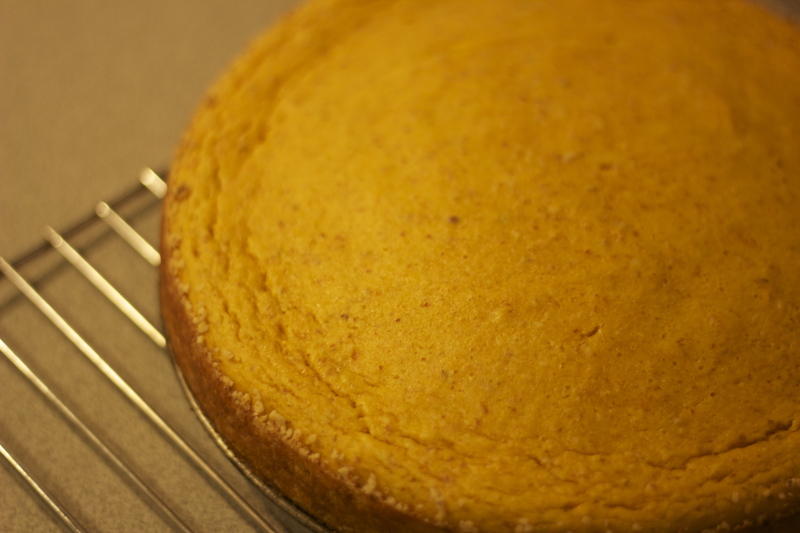 I’ve been experimenting with orange-almond cakes (well, one) lately, but it was most definitely not vegan. One more tweak and I’ll share it here too! Very different.